Aletheia was a leading innovation project, sponsored by the Federal Ministry of Education and Research, that aims at obtaining comprehensive access to product information through the use of semantic technologies. TECO researches in federating information from heterogeneous device such as sensor nodes and RFID tags. Together with ABB we work on platform independent solutions for the integration of the Internet of Things into industrial field service. 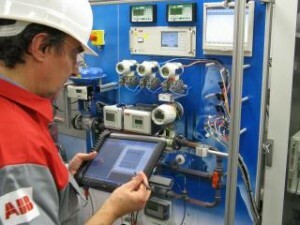 Sensing and servicing industrial machinery using Internet of Things technologies is both important and challenging. In the project we considered practical aspects related to the use of wireless sensor nodes as well as RFID for ad-hoc sensing and servicing at an industrial site. An appropriate basic architecture is considered based on web services and DPWS. The architecture, design and prototype implementation developed within the project takes into consideration the needs from the service application, the heterogeneity of devices used and the future extendibility. We show how efficient sensor technology can be combined with standardized web services using a lightweight modular gateway architecture based on message transformation.